Product information "Berenstargh Dual Charger for V-mount battery 14.4/14.8V (Sony BP-95W BP-190WS)"
Charge two batteries at the same time, or power external devices via DC XLR output. The Berenstargh V-Mount charging system is becoming a future standard for professionals among digital camera and camcorder manufacturers. The Berenstargh V-Mount Charger is compatible with all digital camera batteries that are based on the V-Mount charging system. With a charged battery (at least 1), the V-Mount Charger can be used via CD XLR output as an external power supply for various devices and serves as a backup power supply. The charge level, supply, voltage and other important information can be checked with the aid of different LEDs. 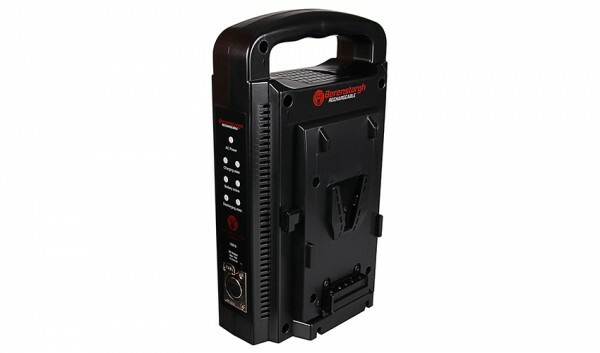 Like other Berenstargh products, the Berenstargh V-Mount-Charger is primarily used in the professional field. Related links to "Berenstargh Dual Charger for V-mount battery 14.4/14.8V (Sony BP-95W BP-190WS)"
Customer evaluation for "Berenstargh Dual Charger for V-mount battery 14.4/14.8V (Sony BP-95W BP-190WS)"